We just got home from a red eye, and then another 5 hour flight from Hawaii. I slept 12 glorious hours last night and I'm feeling refreshed. I also did not get out of my pajamas all day, shower and we ate leftovers. (partly because instacart F***ed up). 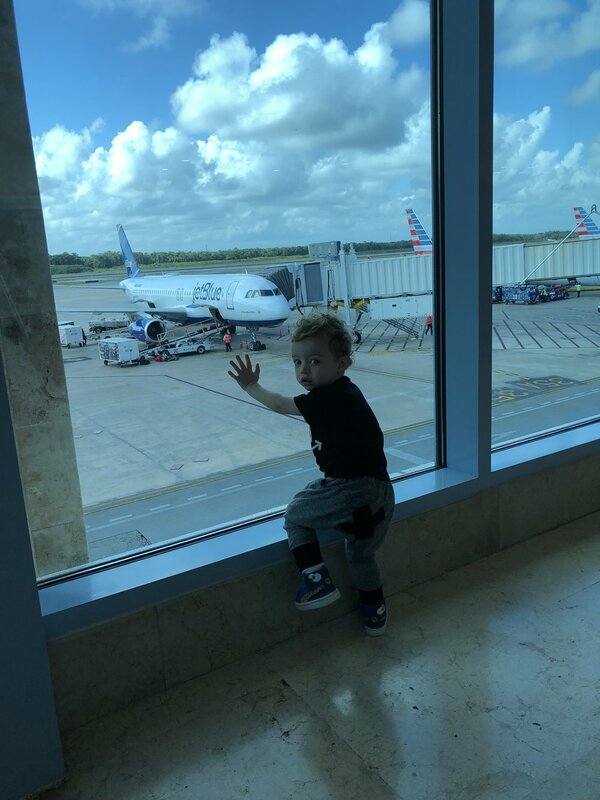 I was not going to write this post, because I by no means think I am good at traveling with a toddler. I give myself an A- for effort though. Ive had a lot of trial and error situations. More than once I've pulled the whole "lock myself in the bathroom while Lewis screams it out" to save a plane full of dirty looks. That one didn't work to well. I've also tried handing him off to a flight attendant, but it turns out not all of them love screaming, red faced, flailing toddlers. And the classic old hand off to dad, which is always a good thought but at this point you might at well put the favorite paw patrol episode on and hope for the best. Anyways a good friend of mine asked if I had any hacks to traveling with an almost two year old. So I give you the things that have worked best for me. GelGlems - Really recently Lewis has taken a strong liking to stickers and using his motor skills to stick, pick up stick again. Make watching the planes really fun for your child maybe even get them a toy plane and start packing in your diaper bag. Lewis became obsessed with planes and he would even sleep wth his little plastic plane. Books espiecially any touch and feel. I used to buy little new toys for Lewis everytime we traveled but he would just be entertained by the seat belt. so I try to find easier things for him to play with that don't cost too much. The APP Child's Play I showed him how it worked and it would keep him entertained for 10 minutes or so. Pack their favorite snack. Maybe its something they don't usually get: cookies, chips, yogurt covered raisins, ginger ale. (Lewis pretty much gets all these things all the time anyways) Then it will be like a treat to fly in the plane if they don't usually get that. I usually go with the window and hope the person with the aisle doesn't fall asleep. Lewis LOVES to look out the window and. also they may not feel as tempted to try to get out if their is a stranger blocking their way. The babyzen yoyo is my favorite travel stroller. its super small, light and easy to UNFOLD if your hands are full. To fold it takes some practice. Anything with buttons or knobs honestly. There is no way to perfectly travel. You just have to grin and bear it and understand that eventually your flight will land, you'll get to where you are going and all these people who are annoyed with you right now, will forget the moment they step off that plane.